Since 1998, we have developed a reputation for the highest quality repair and maintenance, and other vehicle services. Essentially, we have become Langley and the Lower Mainland’s dealership alternative auto repair services centre for domestic and imported cars, including all European models, because we have made problem solving our specialty. Our dedicated services advisor team will exceed your expectations time after time. We have developed an expert team of professional technicians that are well-equipped to handle an array of complex factory-level repairs. Norlang Auto is here to ensure that your vehicles are performing at their very best. Our “Test, Don’t Guess” approach means that you can be assured of an accurate diagnosis of your vehicle’s issues. Our technicians receive ongoing training to ensure that the latest auto problems are caught in the diagnostic and problem solving phase rather than allowing an issue to turn into a major and costly repair. At Norlang Auto, we have the same factory computer scanners and software used in dealerships and connect daily via the Internet to make sure we have the latest software upgrades the engineers offer. We provide you with the latest information on your vehicle at a better value than your local dealership! We always encourage our customers to schedule an appointment for the preventative maintenance, inspections and tune ups recommended by their vehicle’s manufacturer since it truly saves you money, helps you reduce the risk of future repairs and maintains your vehicle’s warranty. When you bring your car in for repairs and maintenance at Norlang Auto, you can be confident that we will only use parts, fluids, lubricants, and techniques that either meet or exceed original manufacturer standards and satisfy the conditions of your vehicle’s warranty. Our highly experienced, well-trained and licensed technicians, coupled with assistance from our subscription to a number of online technical support auto repair services, are able to perform any repair your vehicle may need. On a daily basis, we perform general repairs on engines, transmissions, brakes, steering & suspension, cooling, heating & A/C, and electrical systems. We have experts to deal with even the most challenging vehicle repairs. Norlang Auto also provides specialized auto repair services. By coming to us to perform these services, you will save time and money as compared to performing them at local dealerships. For example, we offer Walnut Blasting/Carbon Cleaning to keep your engine free of carbon build-up and performing like new. Furthermore, we offer owners of BMW Vehicles with a V8 engine series N62 & N62-TU valve stem seal repair without taking the engine out of the vehicle for expensive dismantling. In fact, we can perform this repair for half the cost of what a dealership charges! Another speciality service we offer for BMWs is effective repairs for V8 coolant leaks at a much shorter time than at a dealership, thus saving you both time and money. Like the BMW valve stem seal repair, your V8 coolant leak will be repaired at half the cost of what dealerships charge. Norlang Auto is literally your one-stop tire shop because we provide expert tire repair and maintenance for all vehicles. What’s more, we stock a wide selection of Passenger, Performance, Light Truck and SUV tires, from premium to economy. We provide tire sales & service to fit everyone’s needs and budget. Finally, we can also provide you with tire storage at our secure storage facility. 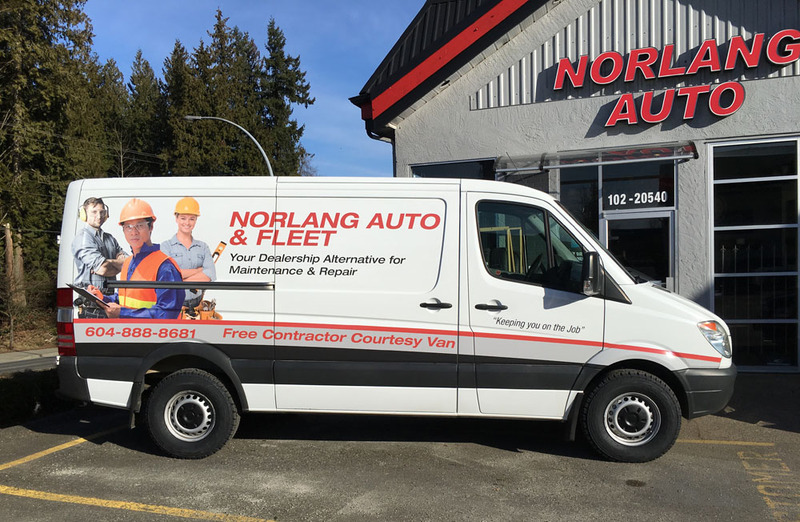 At Norlang Auto, your convenience is important to us, therefore we offer you courtesy shuttle and vehicle services while your car is in our shop. No need to worry about getting to your destination after you drop off your vehicle. Our shuttle will also pick you up when your vehicle is ready. If you need a loaner, we can provide you with one of our clean, late model, well-maintained courtesy cars. For our independent contractor and small fleet owner clients, we provide a very low cost on-site loaner, a reliable Sprinter diesel van. We want to ensure that they are able to to meet their commitments and avoid any downtime.